After 1 year, Mr. Pence Goes To The Dough Disco finally returns to the original site it was supposed to be released on. 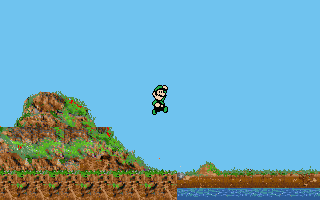 Now featuring New Levels and A new playable character (who's basically a Mario recolour). Mr. Pence originated from some weird shop in Scarborough, UK that I saw over 7 years ago in 2011. That shop is just a faint memory and I have no idea if it's something that actually exists or if it's just something I made up. All I remember is that it had Luigi with the letter "P" edited onto his hat and it was called "Mr. Pence". 11/10 game of the year. I am entertained throughout the whole game.